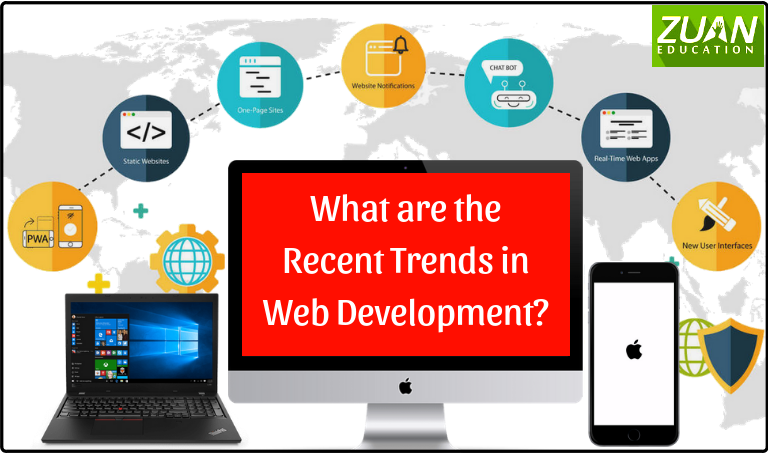 What are the Recent Trends in Web Development? There has been an upsurge in the trends in web development during recent years. Advancements are made in the basic functional programming. Equally important, virtual reality has become the order of the day. Furthermore, your websites on the internet are what represents you and your brand. You see websites in different shapes and sizes. You have small websites built by individuals. Moreover, you have well-built web fortresses owned by mega-corporations. Well, how did web development start? Its history. To begin with, HTML (HyperText Markup Language) programming language was used to code and build websites. Thereafter, developers added styling aspects to their websites. Eventually, you had a messy web look. To mend this mess you had CSS (Cascading Style Sheets). Furthermore, MySQL and PHP too were incorporated. Uniquely, frontend and backend development came in full swing. Looking forward, what more can you expect in the trends in web development in near future. Especially trends that enable the creation of new mobile apps with better user experience. Let us catch of what is about to come. You would have come across these words mostly on your mobile SMSes. So how will Push Notification affect web development in the evolving trends in web development. This trend in web development provides you with a way to notify when content is available. Therefore you need not check your email or browse the site in question. They can reach you any time and anywhere whether you are currently on a website or not. Hence you have an extra channel in your marketing mix with this trend in web development. You can keep the user engaged without big efforts. You can achieve a higher clicking rate as they are clickable. They provide higher results than a regular email marketing campaign. PWA, a trend in web development, lets you have the same and seamless experience while viewing on their mobile phones. Like that on the computer browser. PWA is based on JS, HTML and CSS. They simplify your customer’s interaction with the application. This leads to customer loyalty and conversions. It is fully adaptable in any “smart” device. A humongous percentage of folks use their mobile devices to access sites. Therefore, having a website that is responsive on several devices is need-of-the-hour. You have to design websites that look good on smartphone screens. You can consider the one-page design in this case. The recent trend in web development is that Google has created Accelerated Mobile Pages (AMP). This will ensure your website to give a lightning-fast performance in the smartphones. The trend of AMP is flourishing as it can open websites in less than a second. That’s the power of AMP. The recent trend in web development of static website generators aids in developing a website with plain texts. These are generally stored in files. Static websites that you build using generators give you an advantage of better loading speed, safety, and easy traffic handling. Intelligent Chatbots is the recent trend in web development. It provides you with a way to converse in the same way as if you are talking to a customer care executive. Chatbots are supported by artificial intelligence (AI) and are also referred to as an intelligent agent. Through AI you can clear the questions and doubts of the customers in the best possible way. With this recent trend in web development, Chatbots help your customers through intelligent answering abilities backed by examples and instinctive sources. Artificial intelligence metrics like chatbots save time and huge costs. They also keep your potential customers glued to the business. Taking into consideration how people read, you should minimize the amount of the text on your webpage. This will improve your conversion rates. The advantage of a single page website, a recent trend in web development, is simplicity. You don’t have any complex navigation or deep menu to pass over. Single web page design works well on mobile devices, where scrolling is a common navigation method. Single page site style provides you with a modern solution to simplify your online needs. Moreover, it is inexpensive to develop and host. This is a startling invention in the recent trends in web development. Best-looking designs can be pointless if you can’t find the information you need. Therefore, an interface has been a top concern to developers. Given the trend of simplifying processes, UI moved towards motion UI that keeps your site simple, without flashy advertisements. Hence life is added to a minimalistic site. This is one among the recent trends in web development. UI elements on your website boost user engagement. Because it encourages active user interaction and enhances site usability. Furthermore, this technology offers a high degree of customization. A lot of resources is being spent on app development these days. Time spent on these real time web apps is alarmingly large. These real time web applications are thus synchronized with better user experiences and design. Likewise, Voice User Interface, AR, and IoT for Web will gain momentous traction in web development in the coming years. You can be sure that all of these leading trends are set to open up more opportunities. Especially for web developers at various points on the learning curve. Therefore, web development gives you a considerable upward jolt and fortune to your future career. So why should you miss a great forward-looking opportunity? Apart from other major cities in India, you can also learn web development course in Chennai from reputed IT institutions. You can begin a new career or enhance your skills by learning web development right away. In the meanwhile, you can also understand more about web development by learning about its programming languages.